Step on up and have a seat on the royal throne to see how it suits you. 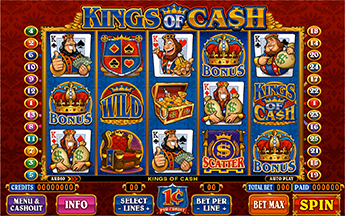 Play your winning hand with the regal quartet of grinning kings. The bags of money and treasure chests are royally yours for keeps. Pick the winning cards to collect your prize in the bonus round. 3 or more Crown Symbols in any position trigger bonus feature. Test your luck and see if the cards are in your favor. Will it be the over stuffed money bags, green bills or golden coins? 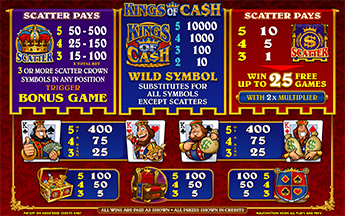 Pick your cards and match 3 kings to win the associated prize. Win up to 1000x total bet. 3 or more Banner Symbols on any position triggers Free Spin feature which can earn you up to 25 Free Spins. All line awards Pay double. Symbols 2, 3, 4 & 5 are stacked during the Free Spins. You can retrigger more Free Spins within the Free Spin round.